Deluxe hard shell case, which gives you and your camera the protection it needs. The front pocket is great for storing extra memory, cords, batteries and your essential. It includes an adjustable neck strap and belt loop to keet your camera safeand secure. Case can be used for digital cameras & other portable electronics. The Screen Cleaning Kit comes with specially formulated cleaning fluid. Use the microfiber cloth in a circular motion to clean your LCD screen. 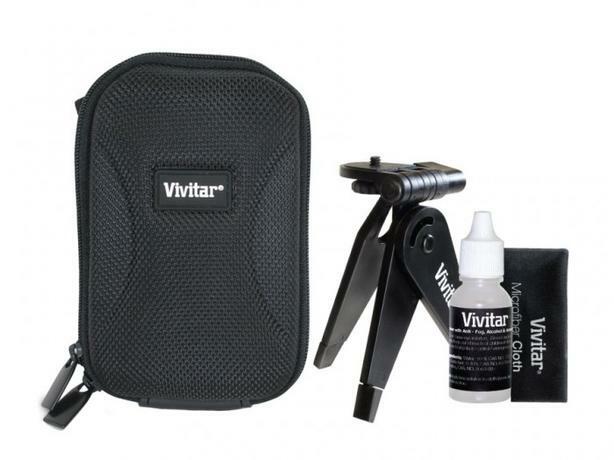 The Vivitar Mini Tripod is sleek, compact and innovatively designed. fITS ALL DIGITAL CAMERA.